Mainline installation will continue starting on Entrada Blvd then heading West on Ignacio Blvd. Traffic control on Ignacio Blvd will include a closure of the Eastbound lanes. Flaggers will be present to direct traffic into the appropriate lanes at the nearest intersection. Paving operations will continue on Redwood Blvd on Monday 3/27/17. There may also be some light work done on the S Novato bike path. This week's night work on Vintage Way was slowed due to weather. The forecast is looking much better for next week though. We expect this work to continue from Vintage Way on Rowland Blvd and then to Rowland Way. Working hours will be 10 PM - 8 AM. Mainline installation on Davidson Street is expected to begin on Monday 3/27/17. 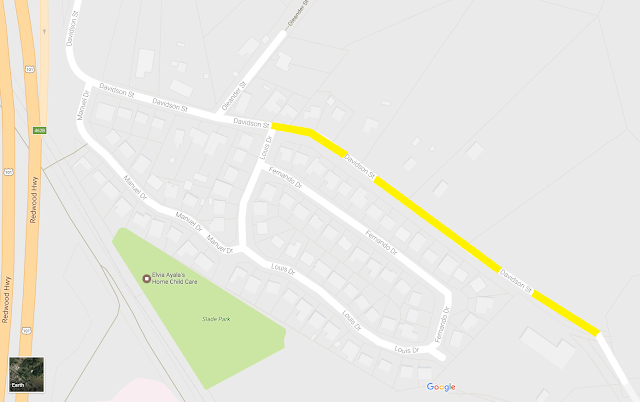 Construction will begin near the intersection of Louis Drive and Davidson Street as shown with the yellow highlighted area on the map below. One way traffic control will be setup around the work area with hold times of up to 4 minutes. Construction activities along Davidson Street are expected to last three to five days. Construction start time is 8:00am. Due to encountering an unexpected utility on Louis Drive, construction activities are expected to be limited for several days next week. No Parking signs will be adjusted to provide residents with additional parking during the reduced construction activities. Starting on Thursday 3/23 a paving crew will be performing the final paving over the trench sections on Rowland and Redwood Blvd. Below is a map to provide more details. The yellow line represents the area that will be paved this week. The blue-green line represents the area that pipe has been installed and is being tested. This section will be paved in the future once it has passed a hydrostatic test. If the weather cooperates, the paving crew should be done with this section by Friday 3/24. Good news! The bike path will reopen for use on Saturday 3/18/17. Weather permitting, some work will still take place during normal work hours next week. While work is ongoing the shuttle service will be provided. If work is not taking place, the path will be open to use. Thank you for your patience. Weather permitting, mainline installation will continue on Entrada for another 2-3 working days, then continue to Ignacio Blvd. towards the Country Club. A second crew that is installing the recycled water lateral and meter will be through following the mainline for another 2-3 days total, although it may be intermittent work. This will be a small crew, about 5 workers. A third crew will be repairing sidewalk, curb, and gutter on Redwood Blvd as well. Also weather permitting, mainline installation will continue on Vintage Way to Rowland Blvd, and then to Rowland Way. This will all be conducted at night. Working hours are 10:00PM-8:00AM. We ask you to please be extra cautious while driving through the area. The flaggers will do their best to get you through and if you have any questions or need help, please don't hesitate to ask one of them. A second crew will also be working at Slade Park excavating a pit for the bore and jack operation that will install pipe underneath the SMART Railroad tracks. This work will be performed during normal daytime working hours. ***Edit 3/20/17: Working hours are 10:00PM-8:00AM for the East side night work. Mainline pipe installation will continue S Novato Blvd. on Monday, and continue for one or two more days. We are doing our best to keep traffic moving. Please be courteous and respect our flaggers and crew. They want you to get home safely just as quickly as they do! The crew will be focused on the bike path re-opening and subsequent work will include main line installation onto Entrada Dr. 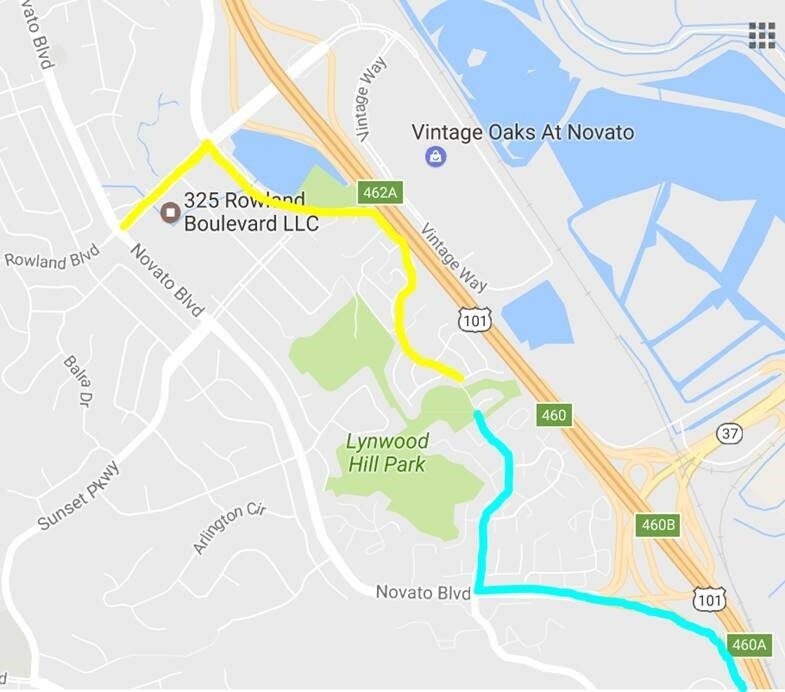 The S. Novato bike path closure will continue through Friday, March 17. While we apologize for any inconvenience, the shuttle service running from Entrada to S. Novato at Redwood Blvd. will continue. The hours of operation will be 6am to 8pm, and shuttles will continue to make round trips about every 20 minutes. Mainline installation will continue along Vintage Way. Some more hard rock was encountered this week which slowed progress, but we are hopeful to get out of it soon. Next up will be a shift to night work for the intersection of Vintage Way and Rowland Blvd. You will see Ghilotti Construction “No Parking” signs on Entrada as early as Monday, March 13, 2017. This is the surefire signal that work is coming! Current schedule shows work continuing for 10-12 business days on Entrada Dr. starting March 15, 2017, then continuing East on Ignacio Blvd. Crews will start installing pipeline from the cul de sac near Dollhouses, Trains, and More and continue north along Entrada Dr. There will be parking restrictions and possible hold times for through traffic of up to four (4) minutes, but there will always be a way in and out. Please plan to give yourselves a few extra minutes to come and go during our work. Flag down a worker in a vest if you need assistance. Work will be taking place within the intersection of Redwood Blvd and S Novato Blvd on Wednesday 3/8 and Thursday 3/9. Traffic will be impacted. Flaggers will be working to get everyone through as quickly as possible, especially during the morning commute. Thank you for your patience. Work has been progressing well on the bike path. It will be completely closed until March 13. Starting March 13, it will be closed only during working hours for approximately 2 weeks. The shuttle service will continue during periods of closure. 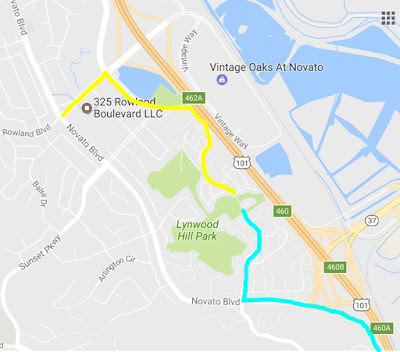 The pick up points will continue to be along S Novato Blvd in the turnout with no parking signs and at the End of Entrada Blvd near the hobby shop. Mainline pipe installation will continue starting at the intersection of S Novato Blvd and Redwood and then head east on S Novato Blvd. Work on the S Novato Blvd bike path will also continue. There will be a smaller crew installing services along Redwood Blvd and also potholing in various locations throughout the project. Mainline installation will continue along Vintage Way. Some hard rock was encountered last week which slowed progress, but we are hopeful to get out of it soon. There will also be a small crew installing steel brackets on the bridge going over Novato creek. You may also see a small potholing operation in various parts of the alignment.